A few weeks ago we started the journey of comparing American and Japanese versions of the same junk foods. In the first installment we sampled Doritos; recently we tried both American and Japanese Oreos, side by side. You may recall that the Doritos flavors differed more than we expected. I came into this taste test expecting the Oreos to be identical in size and taste. Once again we were surprised! Both cookies tasted pretty much the same, though the filling on the Japanese version was perhaps a tad less sweet. The colors varied slightly, which you can’t really see in the photo below. The sizes differed more than I expected. Perhaps the Japanese Oreos are Metric? The bottom line: both versions are pretty much the same. Unless you try both side by side you wouldn’t even notice a difference. In true expat fashion, the kids and I headed to Ikea in Kohoku yesterday for yet another piece of Only While We’re Here furniture. Frankly I’m surprised that anyone here needs to buy any new Ikea furniture at all, given the brisk trade of second-hand Ikea furniture on the local moms’ Facebook group–but there it is. A quick note on pronunciation. English speakers say it eye-KEE-uh, but here in Japan it’s EE-kay-ah. It may sound odd, but the Japanese pronunciation is actually closer to the original Swedish. I found this You Tube link with the Swedish pronunciation, so if it’s on You Tube then it must be true! Before heading to Ikea the first time I scoured the Ikea.jp website, where I was delighted to see an English version. This will be just like shopping at Ikea back in the U.S., I thought. Then I walked into the store and saw this map. I can read enough Japanese very slowly, so I probably could have deciphered the map. But honestly following the path would have taken about the same amount of time, so that’s what we did. Thankfully the store was quite empty on a rainy Tuesday, so we didn’t have to fight the typical crowds. …the meatballs, natch (in our family this is the Meatball Tax, because we can’t visit Ikea without ordering a plate)…. …and the random tableaux that make you want to furnish your house like an Ikea showroom. So what’s different? Japanese style curry at lunch…. ….vending machines for ordering food in the Bistro (we love our vending machines in Japan!)…. …self-serve cutting in the fabric area, where this sign allegedly tells how to cut, weigh, and tag your fabric…. …the opportunity to catch up on sumo results while packing up Swedish Food Market purchases with newspaper…. A few other quirks to Japanese Ikea? The free shuttle bus ferries customers to the nearest train station. I didn’t see any flat packs going on the shuttle, so I’m guessing that carless customers use the home delivery service a lot. Speaking of cars, Japanese drivers love to park nose out–even at places like Ikea and Costco where frankly it would be nice to have the trunk end available for easy loading. After a quick nap near checkout and a snack from the Bistro, it was time to head home. See you next time, Ikea Kohoku! P.S. Not a selfie while driving! Tessa sat in front and snapped this. Because Safety First! For most foreigners, the word “Hiroshima” summons one thought: the atomic bombing, and nothing else. But tell a Japanese person that you visited Hiroshima and you’ll get the following question: “Did you try the okonomiyaki?”. By no accident, our hotel sat right next door to the famous Okonomiyaki Village, and I saved okonomiyaki for the last night’s dinner. Okonomiyaki loosely means “what you like, cooked.” Okonomiyaki is sometimes called Japanese pizza, which I find a lazy description. Yes, it’s round and cut into wedges to eat–but that’s where the similarities with pizza end. Okonomiyaki is a savory pancake with lots of cabbage, pork slices, flour and egg batter, and pretty much anything else you want to add. The pancake is cooked on a flat griddle; said griddle either sits in the middle of the dining table or directly in front of the counter where patrons sit. The default version of okonomiyaki hails from Osaka; all of the ingredients are mashed together in a bowl, and diners often do the mixing and cooking themselves. Traditional toppings include kewpie mayonnaise, aonori powdered seaweed, and a sweet Japanese-style Worcestershire sauce called (surprise!) okonomiyaki sauce. The Hiroshima version of okonomiyaki separates the layers and adds cooked noodles; also the proprietor does the cooking. And to Mark’s delight–no mayo on top. We ventured into Okonomiyaki Village, a building with five floors of okonomiyaki stalls. We chose one vendor pretty much at random and started ordering. Our cook got to work, and I happily documented her progress with our ringside seats. After eating way too much, we headed out for an outing that absolutely no one wanted to do–karaoke! Don rolled his eyes but gamely joined us, because he has manners. My children have no manners but they also have no say because our family is a benevolent dictatorship and not a democracy. And Mark? He didn’t want to do it either, but a situation at work meant that he missed a day of our trip. So he owed me, and I told him so. Some trivia: karaoke means empty orchestra, and it originated in Asia in the 1960s. American karaoke means humiliating yourself drunkenly in front of a bar of strangers; the karaoke machine sits near the stage as an extra. By contrast, here in Japan multi-story, 24-hour karaoke parlors abound. Alcohol and food are served, but karaoke is the main event. Also the experience here is much more intimate and you get a small room for only your group. Work outings often include karaoke, so anyone coming to Japan should have a song or two ready. Once we started singing the initial I Don’t Wannas quickly gave way to fighting over the console for selecting songs. Tessa came around first, and even Don admitted that he enjoyed it more than he expected. And he’s a Johnny Cash and Beach Boys kind of guy, in case you’re wondering. Our hour quickly ran out with songs still in the queue, and we wished we had more time–which is exactly how a karaoke session should end! The next morning we visited a few last sites–the children’s museum for Mark and the kids, the Hiroshima Museum of Art for Don and I–then caught our shinkansen back home to Yokohama. A hazy, speedy Fuji-san sunset marked the perfect coda for a spectacular visit. Grandpa Don returned home to Texas this past Sunday, and we miss him! During the last few days of his trip we visited Hiromshima. 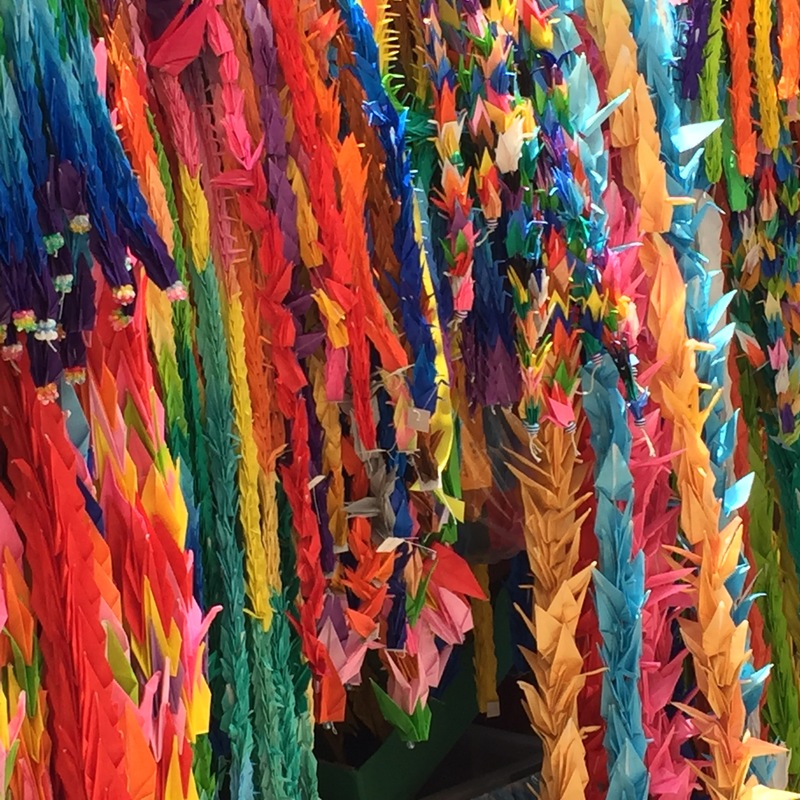 We packed in so much during the four days we spent there that I’m breaking up our Hiroshima visit into a few posts. Last Wednesday we boarded the shinkansen bullet train in Yokohama bound for Hiroshima; as expected, Don enjoyed his first shinkansen trip–because who doesn’t like traveling at 300 KPH? The next morning we boarded a boat for Miyajima Island, a historic island about 45 minutes by boat from the Peace Park. Miyajima immediately reminded me of both Venice in Italy and Mont Saint Michel in France: beautiful, surrounded by water, and visited by tourists for hundreds of years. The most famous sites of Miyajima include The Great Otorii, the iconic red gates that lead up to a shrine. Here the shrine in question is Istukushima Shrine, a UNESCO World Heritage Site. The most famous mammals of Miyajima? Its deer. They wait outside the ferry terminal, beg at food stalls, and eat paper like maps and Japan Rail passes (which are not replaced even if a deer eats it, the guide book warns). We headed uphill away from the main shrine area, and the crowds immediately diminished. The quiet of the forested path instantly calmed us all; I can only imagine the beauty of that lush green forest in the fall when the leaves change color. The kids and I rode the ropeway up to Mount Misen, where we saw……fog. After a few minutes the fog cleared enough to show beautiful vistas of the surrounded islands. After ramen lunch and a little more wandering, we boarded the ferry and train to return to our hotel. We are in Hiroshima to round out Grandpa Don’s last few days in Japan. Most of the photos are on the big fancy camera, and I will write a long post about our visit with those photos when we return home to Yokohama. But I want to record my impressions of today’s visit to the Hiroshima Peace Memorial Museum while my thoughts are still fresh. I’ve visited many museums that fall under the general category of Terrible Things People Have Done to Each Other: the Atomic Bomb Museum in Nagasaki, the Holocaust Museum in Washington DC, and Auschwitz. This was my first time visiting such a place with the kids. I often remind them that we are all ambassadors for America while we are here, and anything they say or do can form good or bad impressions of Americans in Japanese people’s minds. Before we set out we had a quick pep talk to remind them of this, and they did a great job. Both kids were quiet and respectful as we visited the grounds and toured the museum. 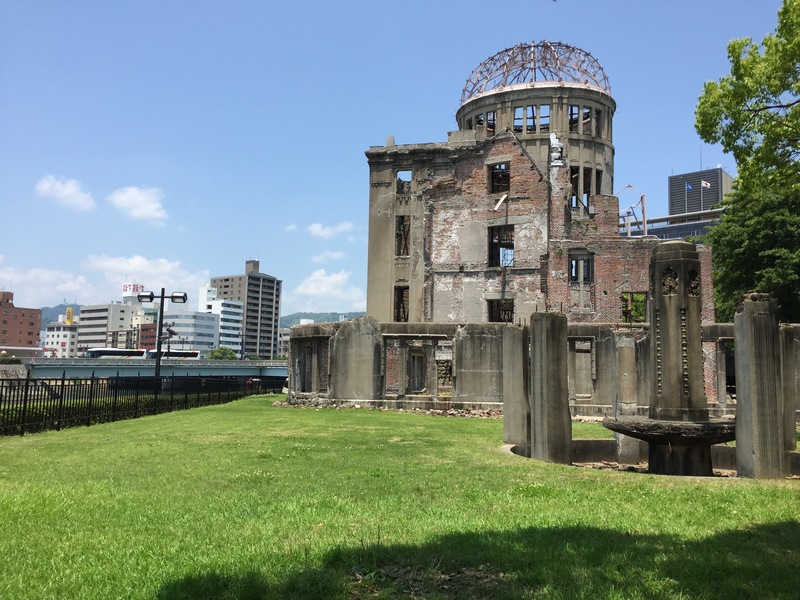 The Hiroshima museum does its best to present the facts of the event in as straightforward a manor as possible without judgment or commentary. Graphic photos show the gruesome injuries sustained by survivors; artifacts like bubbled roof tiles and fused masses of glass jars hint at the unimaginable conditions. I remember hearing past controversies about the terrible treatment of indentured Korean workers immediately following the blast and in the days and months that followed. The museum in Nagasaki admitted that Koreans received no medical care at all, while the Hiroshima museum acknowledged their servitude and the number of casualties. The strangest part of the visit was processing my own feelings about this terrible thing done to the Japanese by Americans. Yes, deploying the bomb ended the war, prevented roughly a million casualties from a land invasion, and so on. I understand that. But it was still such a horror, even if it can be justified at some level. My first instinct was to punt; my people weren’t even in America yet in 1945. My grandparents were still in Poland fighting on the European front, and their siblings both survived and perished in Nazi concentration camps there. But then I realized that it doesn’t matter when my ancestors landed on American shores. I’m an American, and a veteran. It was someone like me who followed orders. Never Again sounds glib and over used, but I can’t think of a better way to say it. Monday was the last day of school and early dismissal at noon. I showed Don around the school and snapped this quick photo. Then Tessa and Don headed down to Motomachi for lunch while Cy and I ate at sushi-go-round. After lunch we regrouped for a quick outing. A pop quiz for all of you fans of New York’s and Washington DC’s Momofuku restaurants: what does that name mean, anyway? The answer: The restaurants are named after Momofuku Ando, the inventor of instant ramen and Cup Noodles. Don, the kids and I learned his story Monday afternoon at Yokohama’s Cup Noodles Museum. The museum itself is a gorgeous space. It’s beautifully executed and worth a visit jus to see the creative design of the building and individual rooms. Even the parking garage is photo worthy! Our first stop at the museum was the My Cup Noodles Factory. We decorated the cups themselves, chose the fillings, and watched while factory workers sealed up the packaging. After that we visited the exhibit about Momofuku Ando. His story is interesting enough: inventor, eventual industry leader, and so on. He invented instant ramen and later Cup Noodles after World War II to help feed the hungry masses for cheap. The exhibit included many glowing terms to discuss the genius of Ando, but honestly I could only think of the omitted words–like “sodium” and “nutrition.” But I digress. After our Cup Noodles stop we headed home to relax for a bit, then picked up Mark at the train station on his way home from work. We took Don to a local shabu shabu restaurant where we introduced him to the joys of cooking meat and veggies in a pot of broth on your table. This Sunday morning the five of us attended Mass at our church, Sacred Heart Cathedral. In the afternoon Tessa headed to a friend’s birthday party while the menfolk and I set out for lunch in Chinatown. First we stopped by a shrine and watched people make their offerings. It’s called 横浜関帝廟, which a little Internet sleuthing tells me means Yokohama Kanteibyo. We’ll just stick with The Shrine Around the Corner from Leyton House [an apartment building where several friends live]. Since our arrival in Japan Cy has discovered the awesomeness of soup dumplings, so naturally he wanted to share the experience with Grandpa Don. We chose a random restaurant in Chinatown that featured assorted dumplings in the window display…. Plastic dumplings in the window display? Check! …ordered some refreshing nama biru (draft beer)…. ….and started eating. In addition to the soup dumplings, we ordered shumai open-top dumplings, some sort of egg rolls with an unknown but delicious creamy filling, another dumpling with unknown filling that tasted like fish and shellfish, and ma po eggplant with a thick, spicy sauce with ground beef (or maybe pork?) all over it. Honestly I don’t think we knew all the ingredients of any dish, but for us it didn’t matter. Ordering Chinese food in Japan is not for the squeamish–or for those with food allergies. After a lazy afternoon back at the house, we all headed out for dinner at one of our favorite restaurants, a pizza place called Luna near Yamate Station. We have our first visitor! It’s Grandpa Don, Mark’s dad, who flew in yesterday from his home in San Antonio. Ever the gracious guest, Don gamely came along as we dragged him to one of our favorite local spots, Sankeien Garden. Back in April we visited Sakeien at night for some nighttime o-hanami, or cherry blossom viewing. Today’s daytime visit showed us another popular aspect of Sakeien–wedding photos! But first some obligatory background on the garden itself. Sankeien Garden got its start in the early 20th century when a wealthy business man named Sankei Hara built himself a fancy house on a nice plot of land near the water. He started filling his property with historically significant buildings from around the country that were in danger of demolition. Sankeien Garden is famous for its changing seasons, and every time we visit something else is in bloom. Today we saw azaleas and hydrangeas, including an azalea bonsai competition on display. After wandering about and snapping photos of the family, I started to see lots of brides. And grooms, I guess–but who notices them? The brides all gamely smiled and flashed the Japanese V as I snuck in a few photos.